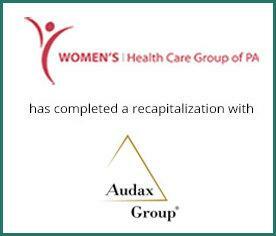 Women’s Health Care Group of PA (WHCGPA) has completed a recapitalization with Audax Private Equity (Audax). WHCGPA provides obstetrics and gynecology services at over 40 locations throughout Montgomery, Chester, and Delaware counties in Pennsylvania. WHCGPA’s caregivers include general obstetricians and gynecologists, as well as other specialized providers. Provident Healthcare Partners served as exclusive financial advisor to WHCGPA. The terms of the transaction were not disclosed. “While Women’s Health Care Group of Pennsylvania was already a well-known leader in women’s health, its new partnership with Audax will enable the organization to expand its high-quality services into underserved areas and support the growth of other practices across the country,” noted AJ Shekar, Senior Associate at Provident Healthcare Partners. “The management team at WHCGPA has built one of the market’s leading women’s health platforms providing the highest quality of care to women in the greater Philadelphia market. By leveraging Audax’ knowledge base as well as their past experience within physician services we envision the Company becoming a national leader in women’s healthcare,” stated Michael Patton, Managing Director at Provident Healthcare Partners. WHCGPA began in 2005 with 40 physicians and has grown in the past twelve years to over 120 providers. The Company focuses on the delivery of healthcare to women beginning in adolescence, and continuing through the years of child-bearing, pre-menopause, menopause, and geriatrics. The providers for the Company are some of the most highly trained professionals in the specialty, and consist of physicians, physician assistants, and nurse practitioners, as well as skilled ancillary staff. For more information, please visit www.whcgpa.com. Since its founding in 1999, Audax Private Equity has been focused on building leading middle market companies. Audax has invested $4 billion in 102 platform and 550 add-on companies. Through its disciplined Buy & Build approach, Audax seeks to help platform companies execute add-on acquisitions that fuel revenue growth, optimize operations, and significantly increase equity value. Audax Private Equity is an integral part of Audax Group, an alternative asset management firm specializing in investments in middle market companies. With offices in Boston, New York, and Menlo Park, Audax Group has over $11 billion in assets under management across its Private Equity, Mezzanine, and Senior Debt businesses. For more information, visit the Audax Group website www.audaxgroup.com.